To find the best rock climbing harness for entry-level climbers, we tested seven popular beginner rock climbing harnesses. Based on the criteria of comfort, versatility and price, we identified the top three climbing harnesses for people getting into rock climbing. The Singing Rock Onyx comes out on top for its price, comfort, and beginner-friendly features. Petzl’s Corax costs more than the Onyx but rated higher among our testers and customer reviews as a beginner-friendly harness. The Petzl Selena harness provides a simple and cost effective harness for those with smaller bodies who are new to the sport. What’s an entry-level climbing harness? As a climber, you spend a lot of time in your harness. You sit in it while you’re belaying, figuring out your next move, and while rappelling. Finding a harness that fits your body is key to an enjoyable experience. As a beginner, simplicity is your friend. Choosing a simple and versatile harness allows room to try various climbing styles. As you advance as a climber, some features you might want to think about when choosing a harness are: weight, gear storage capacity, and whether the harness can hold tools, like ice axes. Choosing to buy your own climbing gear is a big deal, one we intend to simplify for you. As you know by now from walking down the aisle of your favorite gear store, there are a lot of shiny things out there. You’ll likely move on from your first harness in a year or two as you understand more about what kind of climbing you enjoy and your own climbing style. It’s easier to upgrade to the right kind of harness for you if you didn’t spend a lot of money on your first harness. The omitting of gender specifications was intentional. Bodies have different needs that aren't based on gender. Throughout the guide, I do speak to specifics around padding, buckles and fit to inform people about the fit. I also note when a particular harness model has options for smaller or larger bodied people. To research beginner climbing harnesses, we read reviews from Alpinist, Outdoor Gear Lab, Gear Institute, Weigh My Rack, Epic TV, Adventure Junkies, Splitter Choss, and Rock and Ice. Many of these reviews are focused on gear for folks that have been climbing for a while, so we used our own judgement to find harnesses that best serve people who are looking for a solid first harness. We also scanned dozens of reviews from real customers at REI, Amazon, and Backcountry. To find out the legitimacy of customer reviews, we ran each listing through FakeSpot, a website that scans reviews for signs of fraud. We also used these reviews to determine what criteria is important for a beginner rock climber. I also used my own experience as a climber and climbing educator. I was a field instructor for the National Outdoor Leadership School (NOLS) and for GirlVentures, an organization that empowers adolescent girls to develop and express their strengths through outdoor adventures. Before that, I was program manager for Sierra Club Outdoors’ Inspiring Connections Outdoors Program to connect communities with limited access to the outdoors. I’ve been featured as an athlete and instructor in the Alpinist, Melanin Basecamp, and was chosen by Gear Junkie as a 30 under 30. I hold a Top Rope Instructor Certification with the Professional Climbing Instructors Association and a Single Pitch Instructor Certification with the American Mountain Guides Association as part of a Women’s Single Pitch Instructor program led by the American Alpine Club, Flash Foxy (a women’s climbing community), Brown Girls Climb, Camber Outdoors, and Jackson Hole Mountain Guides. My climbing education also includes seminars with NOLS and GirlVentures. I started climbing six years ago when I first moved to Lander, WY. While in Lander, I often joined along when other folks went out climbing. It was after moving to Oakland, CA and working for GirlVentures that I developed a desire to learn the skills needed to be a self sufficient climber. A lot of what I learned was from friends taking me out and watching as they did things. Something that has always helped quell my fear with climbing is knowing my systems and gear well. Knowing how and why equipment works gives me confidence in my climbing. To test the harnesses, I asked friends and my partner to go out climbing with me. The folks who tested the harnesses ranged from beginners to more seasoned climbers. One of the huge advantages of living in Lander is its proximity to Sinks Canyon State Park where there are more than 1,000 routes on limestone cliffs. After climbing in the harnesses, I asked testers specific questions about the fit, comfort and features of the harness that stood out to them while on the wall. The bright yellow waist belt and red belay loop of the Singing Rock Onyx. Photo by Liz Thomas. All harnesses have the following features. It’s important to know them before purchasing your first harness. The waist belt fits around the waist and is adjustable based on desired fit. You want your waist belt to sit on your hip bones and to have thick enough padding to keep you comfortable. REI gives good advice on how a climbing harness should fit and how to put it on correctly. Located on the waist belt, the buckle contains one to two metal pieces that double back through the harness. This metal piece provides the adjustment and closure of the waist belt. These two loops support your legs while in the harness. Good leg loops will be well padded and have some elasticity for comfort. If you’re worried about fit on your thighs, I suggest looking for leg loops that are adjustable (vs. leg loops that “adjust” by being stretchy). Located at the front of the harness, the belay loop is the strongest piece of the harness. 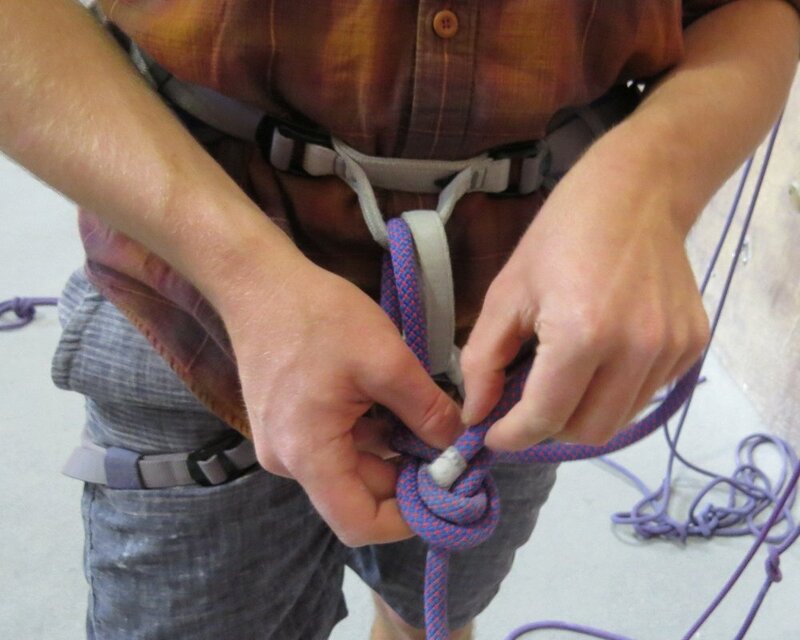 There aren’t many variations of belay loops to influence a preference. Gear loops are located around the waist belt. They are a space to carry your gear (chalk bag, quickdraws, etc.). This diagram by REI details the different parts of a harness. It's important to become familiar with the parts and their functions before climbing. This harness’s features make it beginner friendly, starting with its color. Why? When you’re learning to climb, the different parts of a harness can sometimes be confusing. With a bright yellow waist belt, blue leg loops and red belay loop, it’s easy to identify the parts of the harness. An upwards pointing arrow on the back of the waist belt makes it easier to tell which way is up. This is important when you are learning to put on a harness. The upwards pointing arrow on the back of the Singing Rock Onyx makes it easier for you to know how to put on your harness. The padded waist belt and blue=colored leg loops makes it comfortable to wear Photo by Liz Thomas. The padded waist belt and leg loops offer comfort when sitting in the harness for long periods of time. The leg loops aren’t adjustable but do have a stretchy material to allow for better movement. Weighing only 12 oz., the Onyx is lightweight - making it easy to pack and carry. It tied with the Misty Mountain Volt for the lightest harness we tested. I wore this harness out on a day of climbing in Sinks Canyon State Park in Wyoming. While I didn’t do a lot of sitting in this harness, the waist and leg loops provided comfort for moving around on the wall. I didn’t have a lot of gear on the harness while climbing. Unlike some harnesses we tested, I found the Onyx was very easy to take on and off. The Singing Rock Onyx being testing on a rock climbing wall indoors. Photo by Liz Thomas. The beginner friendly features of this harness elevated this harness to the top of the list. That in hand with the comfort, versatility and low price point make the Singing Rock Onyx an excellent buy. The Petzl Corax emerged as the most versatile of the three harnesses reviewed. This harness makes it a breeze to climb across styles like sport, multi-pitch, or traditional. The Petzl Corax is the most comfortable harness we tested. One of the notable features of the Petzl Corax is being able to adjust the harness from either side with two buckles. This along with adjustable leg loops allows for the most comfort when climbing. Thick padding on the waist and leg loops allows for the climber to be comfortable even after a long day outside or in the gym. It was also easy to take this harness on and off. However, one complaint a woman-identifying tester had is that the size Small on the Corax was too big to feel entirely safe on a smaller body. This sizing chart by Black Diamond gives a sense of sizing based on the harness. Adjustable leg loops made the Petzl Corax is the most comfortable harness we tested. Photo by Liz Thomas. When we scanned customer reviews from Amazon and REI, we found owners of the Corax found that it is “comfortable” and can handle “everything thrown at it." The Petzl Corax is easy to put on and fit. Photo by Liz Thomas. While the features of this harness aren't as beginner friendly as the Onyx, the Corax is a great runner up because of cost and versatility across climbing disciplines. The Petzl Selena is our pick for the best harness for smaller or curvier bodies. Here, a tester takes the Selena out in Sinks Canyon , Wyoming. Photo by Liz Thomas. If you’re looking for a simple and comfortable harness that will fit smaller bodies, then check out Petzl's Selena. From the gym to outdoors, the harness is easy to take on and off and has more than enough space to carry the gear you need. The Selena is a women’s specific harness, which means the waistbelt is more curved in shape and it has a smaller leg-to-waist ratio. It is also offered in a wider variety of smaller sizes than the other harnesses we considered. This is important to note because the Petzl Corax in size small was too big for some of our smaller women-identifying testers. The Petzl Selena waistbelt is more curved. Photo by Liz Thomas. When it comes to comfort, the well padded waist belt and leg loops allow for comfort on at the gym or crag. Furthermore, the elastic leg loops allow for more stretch when hanging in the harness. Some may find that the lack of adjustable leg loops make for a less than perfect fit. The Petzl Corax has well padded waist and leg loops. Photo by Liz Thomas. Owners of the harness note that it’s a “comfortable harness to climb in” and "fits so well." The Petzl Selena being tested at a rock climbing gym. Photo by Liz Thomas. The Selena harness has a lot less features than the Onyx and Corax making it third on our list. We find it somewhat frustrating that the harness we considered that is advertised as a “women’s harness” has fewer features than the harnesses advertised for men. It's worth paying more for the comfort of extra padding in the waist and legs if needed. I recommend this harness for smaller-bodied people doing gym climbing or short days outside. While our testers liked the Misty Mountain Volt, it didn’t make our line-up because it is too technical and expensive for most beginner climbers. Photo by Liz Thomas. The Mad Rock Mars was the least expensive harness we reviewed. It is frequently purchased as part of a Mars Climbing Package which includes everything a beginning climber needs to get started: a harness, a belay device, a chalkbag and chalk sock, and a locking carabiner. The Mars Climbing Package is one of the best deals available to people just getting into the sport. Even through the Mars did its job, it didn’t make the cut because it wasn’t as comfortable as the other harnesses. It also didn’t have the useful beginner-friendly color coding found on the Singing Rock Onyx. We think those features are worth paying for in a first harness. The Mad Rock Mars listing on Amazon also received a F-rating on FakeSpot for fraudulent reviews. We take this rating with a bit of a grain of salt, though. Sometimes unscrupulous third-party retailers who sell on Amazon generate fake reviews to send business to their Amazon storefront. If you’re interested in the Mars harness, we’d suggest purchasing it from a reliable retailer. The Misty Mountain Volt has great waist and leg padding, but our testers thought the other models had better “beginner-friendly” features such as having a safety buckle that auto double backed (instead of only being safe if the climber remembers to double-back their buckle). We included this harness because it is Made in the USA and is marketed as a women’s harness. However, we found the other harnesses also offered more versatility. According to Backcountry.com, this harness is best for climbing off-width traditional routes. It also is expensive for a first harness. The Metolius All Around, while a very robust harness, is quite technical and a bit overkill for a new climber. It's used by big wall climbers and vertical professionals. It’s also the most expensive harness that we considered. Consider renting harnesses and testing them out in the gym before committing to one. Or, visit a local outfitter to try a harness on for size. As always, safety comes first and you should be confident in your skills before heading out - or up. How does one gain these skills and confidence? See section below. In order to be safe, you need to use a harness that is the correct size for you. Harnesses come in different sizes, kind of like pants. Your waist belt should be snug but not too tight. REI gives good advice on how a climbing harness should fit and how to put it on correctly. If you are a smaller bodied person, you may find that the unisex or men’s versions of climbing harnesses are too big for you, even when you opt for a size Small. If this is the case, choose a women’s or kid’s harness. Your safety literally depends on it. To help identify the different parts of a harness better, use a harness that color codes the different parts of the harness, like our pick, the Onyx Singing Rock. The author on a climb in Red Rock Canyon, Nevada. Photo courtesy Grace Anderson. Learning a new sport can be incredibly exciting and fortunately as climbing becomes more popular, there are a few different routes to take. Many gyms and local organizations offer introductory classes for those who are new climbing. The advantage of taking these classes include the ability to learn in a more controlled environment and access to gear rentals. As your skills progress, you can check out other classes offered by the gym including “gym to crag”, “anchor building”, and “learn to lead”. If festivals are your scene, you might want to consider taking an intro to climbing clinic during a festival. The American Alpine Club’s Craggin’ Classic, Women’s Climbing Festival, Color the Crag, and the Red Rock Rendezvous are a few of the many festivals that offer introductory clinics. Festivals are great because not only can you learn new skills but you also are introduced to an entire community of climbers who are potential adventure partners! Learning new climbing skills can be overwhelming. Sometimes being among a group of people with shared identities and experiences can make the learning environment more comfortable. Luckily, grassroots organizations are beginning to pop up to offer spaces for folks from communities that are not as visible in the mainstream climbing community. Some examples of groups are Alpenglow Collective, The Brown Ascenders, Brown Girls Climb and Flash Foxy. A lot of climbing technique is about muscle memory which is why learning correctly the first time is imperative. Before signing up to take a class or clinic with an organization ask the following questions: Who is teaching the classes? What experience do they have? Does anyone teaching have any formal training or certifications? Examples of legitimate certification groups include the Professional Climbing Instructors Association, American Mountain Guides Association, the Mountaineers, Colorado Mountain Club, and Mazamas. The first time I went climbing, I swore it off. I was terrified and felt too clumsy to even get off the ground. I went out a few more times after that and finally started to feel comfortable on the wall and with the systems. It took going out with the right people and at the right time. If climbing doesn’t feel great the first time, I encourage you to give it another try. Maybe with different people and a different spot, you may find it enjoyable.